Marcelo Bielsa was presented with a lifetime achievement award at the Italian Federation in March 2015. At the time, he was the manager of Olympique de Marseille. The Argentinean manager then gave a well-received presentation about his theories of football to coaches and other luminaries. 1. On his 28 Total Modules gleaned from 50,000 games. 2. On his magnetic appeal at Coverciano. 3. On his 50 Videos. 4. On his 50 Shades of Football. I began World Football Commentaries 11 years ago today. Please enjoy this presentation as a small token of gratitude to my readers. 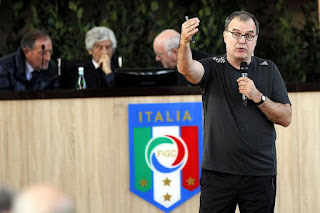 Marcelo Bielsa (at that time the manager of Olympique de Marseille) was presented with a lifetime achievement award on Monday, 9 March 2015, at the Italian Federation (FIGC) in Coverciano, Italy. His presentation was given behind closed doors to the elite of Italian football including Antonio Conte who sat at rapt attention in the front row. Matteo Dalla Vite (@Emmedivu) of La Gazzetta dello Sport was in attendance and provided some excellent reporting of Bielsa's well-received discussion that lasted over an hour and a half. Apparently, when asked for an interview, Mr. Bielsa succinctly replied, "No thank you. It's been over 20 years since I've given interviews." "In an hour and a half of lessons, 'El Loco' (the Crazy One) recounted a thousand things. One above all of them, beyond the two phases of play, positions on the pitch, reasoned aggression against closed-down defenses: In football, after having seen 50,000 games, 28 different modules exist and not one more. His own words. And it is a codified type of football: Maniacally so. And who knows if we'll see this sooner or later in Italy." "Marseille's manager arrived in Florence on Saturday night by car. Two hours later, he was joined by his mother and wife who arrived from Argentina with all expenses strictly paid for by him. El Loco, in an hour and a half of lessons, conquered Coverciano. Everyone was fascinated. Everyone was talking about it. Everyone wanted an encore. 'If time didn't run out, he could have gone on for another three hours. He transmits an incredible passion and love for football that is crazy', noted a manager between the lines of the main hall. 'He said two illuminating things on the positioning of players,' added two others. 'You see that he has spent his entire life studying football', said another." "Marcelo had prepared for this lesson for months. He sent a program (to the FIGC) and then changed it by assuring that the translations were perfect. And above all, with accompanying slides that displayed his methodology along with his studies of football. Because he is studious, Bielsa always does it this way. There were 50 training exercises and situations of play, one after the other, being passed around the hall. He never stood still by recounting, explaining, and showing the joy of an archaeologist who had discovered the Holy Grail. The translator/interpreter, who struggled to keep up, stood behind him, overflowed by information from El Loco. The audience was enthusiastic. When Bielsa received his award with a testimony read by Gianni Rivera, all of the coaches applauded with conviction in a standing ovation." Former Milan legend, Gianni Rivera, is the President of the Technical Sector at the FIGC. "Marcelo had 50 sheets in his hands: The shades of his football. He expressed his own thematic views in every direction: The defensive phase on the anticipation of centerbacks (a fundamental phase). But above all, he focused on how to attack, either down the middle or on the flanks, movements, playing the ball into space, the vertical look and all that you should do in your rival's box. And he brought forth everything to rationalize this statement. A break for lunch with some prosciutto and a friend with whom he went into extra time: Rafael Benitez. Then El Loco left, silently, with his mother and wife. And a wave from the tactics board behind him." Italian Source: 50 Sfumature di Loco: Marcelo Bielsa incanta a Coverciano, 10 marzo 2015, Matteo Dalla Vite. Bielsa: "My football is emotion. There isn't only money." This article was originally published at The Soccer Translator.